This July the Chicago Arts Center and New York’s Ukrainian Museum will hold an exhibit of paintings by Malevich, Bohomazov, Yermilov, Burliuk, Maksymovych, and many other noted Ukrainian artists. Entitled “Ukrainian Modernism: 1910-30,” the show is being organized on the initiative of Prince Nikita Lobanov-Rostovsky, a member of the board of directors of the Foundation for International Arts and Education (Washington, DC), in collaboration with art specialist Dr. Dmytro Horbachov, and with the support of Ukraine’s Ministry of Culture and Tourism and the National Art Museum of Ukraine. My conversation with Dr. Horbachov touched on the upcoming exhibit and the unique artworks that will be on display. We also talked about a longstanding problem, namely whether works by renowned Ukrainian artists will be returned from private collections to Ukraine. “Nikita Lobanov-Rostovsky, a noted collector, art patron, and consultant to Christie’s and Sotheby’s, recently visited Ukraine,” Dr. Horbachov told The Day. “He and I visited various regions in search of masterpieces. It all started after Lobanov-Rostovsky spotted artworks of world caliber at the Kyiv Theatrical Art Museum on the grounds of the Kyivan Cave Monastery. He was also shocked by the lamentable state of Ukrainian museums. Stunning paintings were gathering dust in sealed-off museum ‘fund’ rooms. “The unique set designs of the early 20 th century were an unparalleled phenomenon. Nowhere in the world did set designers make easel works. As a rule, Western artists prepared working sketches for the theater (including Picasso, Braque, and Chagall). Our artists, starting with Bakst, did two versions: a working sketch for the stage and a full-fledged easel painting, as in Petrytsky’s case. This is proof that our artists worked not only on commissions but also painted works for themselves, for the sake of pure art. “Lobanov-Rostovsky, who has been closely following creative life in Ukraine for a long time, conceived the idea of holding a Ukrainian modernist art exhibit in the West. 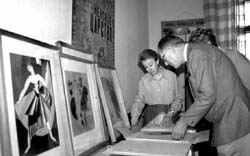 The Washington-based Foun dation for International Arts and Education has the funds for organizing such an exhibit and renting the premises; that was how the idea of showing Ukrainian avant-garde artists in the United States emerged. “One of the conditions was that only large works could be submitted because US audiences appear to have special optical characteristics; they seem unable to “see” small-format paintings. In contrast, the Japanese prefer miniature works of art and can look at them for a long time. We discovered several magnificent works of art in Kyiv and other Ukrainian cities. But Lobanov-Rostovsky was sad because there wasn’t enough ‘critical mass’ for a full-fledged exhibit, so he proposed to expand its format and call it ‘Ukrainian Modernism,’ meaning modern plus avant-garde. Apart from the gifted Novakivsky, another talented Ukrainian artist by the name of Maksymovych specialized in the field. He was destined to live a short life — he committed suicide at the age of 20 but left behind interesting works as the number-one artist of the ‘Ukrainian school’. Nevertheless, by force of Soviet mental habits, Maksymovych is still regarded as a dilettante. “The arrangements for the exhibit took six years, and during that period Lobanov-Rostovsky and I became real experts on Ukrainian private and museum collections. We unearthed around 100 works of art that will be displayed at the Chicago Arts Center and the new Ukrainian museum in New York City. We managed to carry out this creative project thanks to the personal support of President Viktor Yushchenko. We know that most of the works created by Ukrainian avant-garde and modernist artists were destroyed. What happened to their creators? Surviving inventories state: “Artist shot, painting was destroyed.” Dr. Horbachov succeeded in processing part of the collection and using the newly discovered paintings to create a fundamental study entitled The Ukrainian Avant-Garde, 1919-1930. You have studied and rediscovered works created by artists who were banned by the Soviet government, and returned them to the National Art Museum. Today the names of Malevich, Petrytsky, Ekster, and Bohomazov comprise the museum’s “gold fund.” Could you describe your work on the “Ukrainian avant- garde?” How was it conceived? D. H.: “In the 1930s-1940s all formalist works of art, so-called “anti-Soviet” paintings, were denounced. The museum had a separate room in which all condemned works of art, with their canvases removed from their frames and rolled up, were stored. They were supposed to be burned. However, since the size of these paintings ranged from small to large, disposing of them required special vans. So the pictures were stored there, awaiting destruction. “Eventually, the authorities must have forgotten about them and that was how they survived. Some artists were not lucky, as their paintings were scrubbed off the canvas or even shredded. During that period paintings banned by the authorities was regarded as the creativity of “enemies of the people.” For example, there was a whole saga around Petrytsky’s portraits. Some of the writers he had portrayed (Liubchenko, Khvylovy) were purged and their portraits were burned. But there were cases where museum employees would hide “taboo” works by rolling up the canvases and storing them in their “fund” rooms. When I started working as the museum’s chief security officer, I was told to accept shipments of canvases without actually examining them. I was supposed to just check the number, sign the invoice, and forget all about it. “In the early 1960s there was an exhibit by the artist Sayenko in Kyiv. An art critic named Vorona declared during the opening ceremony that we were praising Sayenko because he was a pupil of Boichuk. We should explore Boichuk’s works again and see if we were wrong in our previous estimation of them. This statement prompted Boichuk’s opponents, who had cut up his canvases in 1937, to forward a complaint to the Central Committee. Several days later I was instructed from “upstairs” to find Boichuk’s works, look at them again, and submit my findings on his kind of pictorial art. “I remember hanging the wrinkled, damaged paintings on the walls of the cellar. Right next to the rolls of Boichuk’s paintings, I spotted the works of Palmov and Bohomazov. I was impressed by their work. Boichuk’s supporters were keen innovators. Even today Western art critics are unable to assess their true value when they are exploring their works for the first time because it is difficult to establish criteria for Boichuk and his school. I believe that the works of Palmov, Yermilov, Petrytsky, and Bohomazov look “Western,” judging by their creative language; at the same time they are very germane to Ukrainian culture. “But contemporary art critics know that our supremacist Malevich was Pymonenko’s pupil and that he must have acquired some knowledge from his teacher. Years later, the artworks of Boichuk’s followers found their way to the art museum. “You know, when I started studying the canvases hidden in the museum’s storerooms, I realized that Ukraine in the 1920s had its own, inimitable, and very talented school of art. At the time our Kyiv Art Institute was a kind of Bauhaus, and Kyiv was a mecca for leftwing artists for several years. During this period Tatlin, Malevich, Petrytsky, and Arkhypenko [Archipenko] worked in the Ukrainian capital. The film director, Oleksandr Dovzhenko, was working on his film Earth. In those days Kyiv boasted the world’s only professional theater of the absurd known as “SoZ,” an acronym meaning “socialist emulation.” Here every creative endeavor signified a novel trend, a desire to reach world standards. Then the Diaspora “became inspired” and joined in. “By the way, people of Ukrainian descent who lived in Leningrad proudly identified themselves as Ukrainians. It was a matter of prestige. Parisian Ukrainians, among them Radko, Babiy, and Burliuk, wrote that they were true sons of Ukraine. A number of Russians visited Kyiv at the time simply because they knew they could accomplish something here that they would never be allowed in Moscow. Dziga Vertov made the first documentary in Kyiv, entitled Man with a Movie Camera, now regarded as a classic of cinematography. Vertov was seen in Russia in the 1930s-1940s as a rank-and-file Mosfilm Studios film editor in Moscow; no one wanted him. He was scared and depressed. There was no way to go abroad during the Iron Curtain era. “After I became interested in the Kyiv art school of the early 20th century, I made a discovery: Bohomazov. We visited the artist’s widow and saw mind-boggling works of art; they are now scattered throughout the world and cost a fortune. In the Bohomazov archives I found a portrait of Karl Marx. I brought the engraving to the curator of our museum, but he refused to put it on display, saying that Bohomazov was a formalist. “I had to resort to subterfuge. The centenary of the International was approaching and the museum was staging an exhibit. It didn’t have a single portrait of Marx, so I talked the management into displaying Bohomazov’s portrait. The caption read “Karl Marx” in block letters and had Bohomazov’s name underneath in small print. That was how we first displayed that “formalist.” We got press reviews, and Bohomazov’s name appeared in print after long years of being ignored by the media. “Gradually, art lovers began to discover his creative heritage. In 1966 Pavlo Zahrebelny helped us organize a Bohomazov exhibit at the Writers’ Home, although he had to listen to a lot of reproaches from “a group of outraged members” of the Writers’ Union of Ukraine. The exhibit did take place, contrary to bureaucratic hurdles, and was followed by articles in newspapers and journals. A number of distinguished foreign specialists and art collectors took an interest in Bohomazov’s art. Prince Nikita Lobanov-Rostovsky visited Kyiv. He purchased some Bohomazovs and took them with him. He later donated them to the Guggenheim Museum. “Some of Bohomazov’s paintings found their way abroad thanks to Serhiy Hryhoriants, who smuggled them out in diplomatic pouches (this would later cost him a term in a Soviet prison, on charges of “illegal currency transactions”). Despite all sorts of obstacles, the works of our artists were displayed in the West. Nakov, the famous Russian art historian, noted that there was an avalanche of rapturous reviews. Art critics were unanimous in declaring that a new name of world rank had been discovered. Analyzing his discoveries in Ukraine, Nakov wrote that there were many avant-garde painters here, including Malevich, Ekster, Tyshler, Arkhypenko, and Bohomazov, and that behind these names unquestionably stood a real school of art. “Later Lobanov-Rostovsky asked me to prepare a long article about the Ekster school in Kyiv. The cubist-futurist set designs eventually grew from these roots. I was interested in this study and discovered a number of facts that even took me by surprise. “In the 1960s and 1970s, when I was unearthing paintings by Palmov, Bohomazov, and other artists in the museum basement, Ukrainian intellectuals began to visit the museum. The news of these “vernissages in museum storerooms” reached Moscow. Then foreigners started visiting the museum, and I was fired from the museum because in its storerooms I had shown works by officially banned Ukrainian avant-garde artists to the noted French art specialist Jean-Claude Marcade. Dr. Horbachov, in 2000 you broached the fate of Prince Nikita Lobanov-Rostovsky’s collection during an interview with The Day. He had suggested that it be acquired for a museum in Kyiv, so that the priceless works created by Ukrainian artists would remain in Ukraine. Six years have elapsed and the question remains open. D.H.: “It took Lobanov-Rostovsky years to purchase paintings for his collection. The prince doesn’t have a direct heir. He wants his collection to be kept intact. He has had offers in the West, but the prospective buyers made it clear that they would start selling the paintings from his collection. The prince wants his collection kept in a state-run museum. Moscow Mayor Yuri Luzhkov was interested, but ill-wishers succeeded in convincing him that the collection includes counterfeit works. This is not true! I know every work of art there. “However, it has been difficult to find interested people in Kyiv. I visited the mayor’s office. They listened to me carefully and asked, “How much does this collection cost?” I told them that, according to Sotheby’s estimates, it was in the neighborhood of three million dollars. This is not a large sum, considering the Ukrainian capital’s budget. Then we studied the question of suitable premises for the collection: there’s an old building on Moskovska St. (the Cultural Heritage Museum). We even found a patron, a young Kyiv millionaire, who showed an interest in the prince’s collection. He met Lobanov-Rostovsky, they signed a tentative agreement, but the Ukrainian businessman went bankrupt before it came time to transfer the agreed sum to the prince’s bank account.